Mix soaked split mung beans (moong dal), carrot, coconut and salt thoroughly. Heat the oil in a ladle, and wait for the oil to reach the right temperature. To check this, add a small amount of mustard, and it should start cracking/popping. If it is at the right temperature, add the mustard seeds, asafetida, cilantro, and chilis. Let everything sit in the oil for few seconds. Add this seasoning to split mung dal, carrot, coconut, and salt mix/salad. 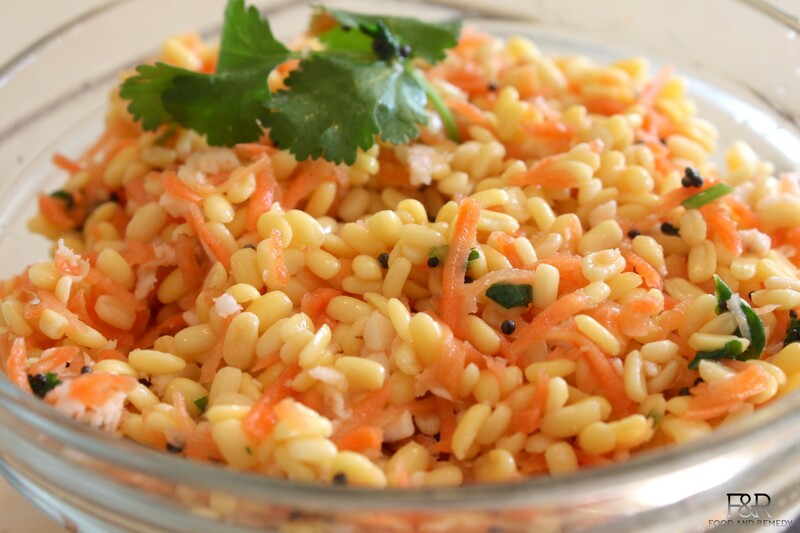 Mix the above dressing with the split mung beans, carrot and coconut salad.